If ever there was a circuit to make one forget you-know-what, it has to be Spa. There is nothing on the calendar that can approach the sight of the cars screaming down the straights, swooping through high speed bends, bouncing over curbs through the chicanes, all set in a dramatic backdrop of brooding pine forests, rolling hills and secretive valleys, skies that change by the minute from bright blue to grim and dark rainclouds. And the in-car shots of the flat-out run through Eau Rouge, the direction, gradient and camber changes, the car teetering on the edge of disaster on the outlet, it is completely and unarguably wonderful. I love it. It may be that Eau Rouge has lost some of its terror, now that the cars are so glued to the road by downforce, but memory supplies that edge and we think of the times that the corner has bitten the overconfident and given us a glimpse of genius at action. 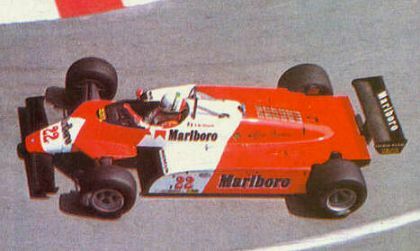 I shall never forget the sight of little, insane Andrea de Cesaris on the absolute limit, swooping through Eau Rouge, down and up and round, millimeters from losing it completely, as he sprinted away from the rest in the Alfa Romeo 183T. It was his and the Alfa's finest hour, except that it was no hour and the powerful, beautiful but fragile Alfa engine exploded after a few glorious laps to ruin what would have been the most famous and unexpected of victories. In the long list of F1's might-have-beens, this was one of the greatest. And it was Spa that gave the memory to me; it must remain forever my favorite of modern circuits as a result. I forgive it everything, the Bus Stop Chicane in the first place, the removal of the Bus Stop this year (yes, it grew on me), its occasional disappearances from the calendar, everything is forgiven as long as it always returns. I love Spa. Today in qualifying the Ferraris demonstrated a slight advantage over the McLarens on this circuit, Raikkonen majestic on his way to pole, Massa nearly as quick on his way to second place. Confirming that this was the day of the established stars, Alonso was next up, just ahead of his team mate. The Beemers were there as usual but Kubica must give up his fifth slot thanks to an engine change; he will start from 15th. Rosberg underlined his growing value as he slotted the Williams in between the BMWs, pushing Heidfeld down to what will be sixth. And the top ten are completed by the qualifying stars Webber, Trulli and Kovalainen, with Fizzy creeping into tenth, Kubica's loss Giancarlo's gain. Chalk another one up for Liuzzi as well - he grabbed 15th while Vettel could manage only 17th. Great taste in drivers, Berger! But it hardly matters who will start where. It's the circuit that's the thing here. The race may be yet another processional bore-fest but the circuit guarantees that there will be moments when the sight of someone at the ragged edge on the most challenging corners in F1 will justify everything. Who does not love Spa, does not love racing. Francorchamps-Spa ...... a GREAT circuit, everyone's favorite but what a boring race. Sato doing his outside pass on Button was the highlight of the day. ANOTHER win from pole.....10 of 14 this year, adding to the boredom of F1. What to do? I have to say i think that the highlight of this race was Kubica's fight with almost everybody. What a brilliant drive he made, it was as you almost could see the glow in his eyes through the visir of his helmet. And of course, the most horriffic moment must be the one between Alonso and Hamilton. I think that by the end of the season, one or the other will have taken his teammate of the circuit. And thinking about all the honor and stuff Hamilton always talks about, i bet it will be Alonso who will take Hamilton off the road. The result will be them both missing out of the points, or even the race, and the championship will go to Raikkonnen. Raikkonnen is the only driver whom i have allways been having a kind of a soft spot for. Listening to hin during the pressconferences and readind his comments on things, on the sparce ocations that they appear, he always talks right out of his mind. The thing that makes me think he will become the champion this season, is tht he have begun to smile and make jokes, looking as if he really are having a great time at Ferrari. All the while the McLaren drivers intensify their fight more at each race. The end of this year really looks as it could be a nailbiter. So hold on to your trousers and put on your helmet. The race is not over yet. I agree Björn, Kubica was excellent, always trying and often succeeding in getting past other cars. Sutil, too, was magnificent, given the fact that he is driving a Spyker. And I'm even beginning to agree with you about Kimi. I was backing Alonso but today I realised that I won't mind at all if Raikkonen wins the championship. He deserves it for saying the least and letting his driving do the talking. You can do track days at Spa, that has to be one of the ultimate things you can do on a bike - fling yourself around Spa as fast as you dare. One day... one day.